^ a b 桑野 (2011), pp. 38, 89. ^ a b c IEA, Energy Technology Perspectives 2010, Chapter3, Table 3.2 - 3.5 Archived 2011年8月26日, at the Wayback Machine. ^ a b The solar shakeout, and what to expect in 2012, PV Magazine, 2012 Jan 11. ^ ロビンス (2005), pp. 131-132. ^ A Vision for the Modern Grid(NETL) Archived 2008年12月30日, at the Wayback Machine. ^ IEA, Deploying Renewables 2011 Archived 2012年5月18日, at the Wayback Machine. ^ 航海中に太陽光で充電 最新鋭の自動車運搬船公開、MSN産経ニュース2012年6月25日 Archived 2012年7月4日, at the Wayback Machine. ^ http://www.pvsystem.net/mongolia/mngpvabs2.html Archived 2007年3月25日, at the Wayback Machine. ^ ロビンス (2005), p. 261. ^ 日本における一日の電力需要の変化の例：電力の需要量の変化とその対応 Archived 2009年9月17日, at the Wayback Machine. ^ H.Wengerら, 1996年 Archived 2005年12月23日, at the Wayback Machine. ^ 小長井ら (2010), p. 120. ^ a b D. C. Jordan, S. R. Kurtz, Photovoltaic Degradation Rates — an Analytical Review, Progress in Photovoltaics: Research and Applications, 2011. ^ W.H.Holley Jr., S.C.Agro, J.P.Galica, R.S.Yorgensen,UV stability and module testing of nonbrowning experimental PVencapsulants, Conference Record of the Twenty Fifth IEEE, May 1996, pp.1259 - 1262 Archived 2010年3月6日, at the Wayback Machine. ^ D.L.King et al, Photovoltaic Module Performance and Durability Following Long-Term Field Exposure, Sandia National Laboratories Archived 2008年5月17日, at the Wayback Machine. ^ Niels Wolter, Joe Burdick, Photovoltaic (PV) Roofing Products - Are They Reliable?, 2003 Archived 2008年11月19日, at the Wayback Machine. 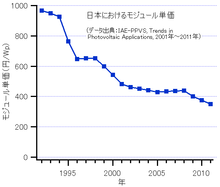 ^ http://www.uni-solar.com/interior.asp?id=100 Archived 2006年3月20日, at the Wayback Machine. ^ Ewan D. Dunlop, David Halton, Progress in Photovoltaics: Research and Applications 14 (2005) 53. ^ Alsema, E.A. ; Wild - Scholten, M.J. de; Fthenakis, V.M.Environmental impacts of PV electricity generation - a critical comparison of energy supply options ECN, September 2006; 7p.Presented at the 21st European Photovoltaic Solar Energy Conference and Exhibition, Dresden, Germany, 4-8 September 2006. ^ a b c d 太陽光発電情報、2011年5月分、資源総合システム Archived 2012年3月5日, at the Wayback Machine. ^ Global Renewable Energy Trends, Policies, and Scenarios, Eric Martinot, June 3, 2008 Archived 2009年9月20日, at the Wayback Machine. ^ US commerce department brings heavy tariffs against Chinese solar panels, Guardian, 2012 May 17. ^ 日本における太陽電池出荷量の推移(JPEA) Archived 2012年5月25日, at the Wayback Machine. ^ a b 平成22年度第4四半期及び年度値 太陽電池セル・モジュール出荷統計について、太陽光発電協会(JPEA) Archived 2011年10月9日, at the Wayback Machine. ^ 石田雅也 (2015年9月29日). “夏の電力供給に太陽光と風力が貢献、東京電力の管内で377万kWに (1/2)”. スマートジャパン (アイティメディア). http://www.itmedia.co.jp/smartjapan/articles/1509/29/news026.html 2015年11月28日閲覧. "東京電力の管内では8月7日...に最高気温が37.0度に達した。...家庭や企業の冷房需要が増加して、昼間の13時台に今夏の最大電力を記録した...夏の電力需要と太陽光発電の出力は比例する場合が多く、晴天による冷房需要の増加があっても同時に太陽光発電の発電量が増える。...電力をピーク時に太陽光で供給できるようになった。"
^ a b 平林大輔 (2015年8月8日). “太陽光、ピーク時肩代わり 夏の電力需給 猛暑、晴れて本領”. 朝日新聞 東京朝刊: p. 3. "...夏のピーク時の電力供給を補う存在になりつつあるのが太陽光発電だ。太陽光は天気に左右される不安定な電源とされるが、猛暑の日はまず晴れており、電力の供給面では頼りになる。...国内の太陽光の導入量は...15年3月末には約2700万キロワット...実際の出力はその6割程度に下がると計算しても..."
^ 平林大輔 (2015年9月3日). “太陽光発電、1割担う 今夏ピーク時の電力供給 原発十数基分”. 朝日新聞 東京朝刊: p. 1. "沖縄を除く電力各社への取材で...電力需要の...ピークは9社とも8月上旬で、太陽光の最大出力は午前11時台から午後1時台...最大出力は合計で約1500万キロワット。原発だと十数基分に相当する。"
^ 石田雅也 (2015年10月15日). “夏の電力需給に構造変化、太陽光発電が増えて「脱・電力会社」が加速 (2/2)”. スマートジャパン (アイティメディア). http://www.itmedia.co.jp/smartjapan/articles/1510/14/news024_2.html 2015年11月28日閲覧. "沖縄を除く9つの地域で最大需要を記録した時間帯の太陽光発電を合計すると1093万kWに達した。原子力発電所の10基稼働分に相当する規模だ。"